Strong Weak We recommend against arthroscopic knee surgery in patients with degenerative knee disease All Applies to Click fordetails  Weak Benefits outweigh harms for the majority, but not for everyone. The majority of patients would likely want this option. Strong Benefits outweigh harms for almost everyone. All or nearly all informed patients would likely want this option. Healthcare administrators and funders may use the number of arthroscopies performed in patients with degenerative knee disease as an indicator of quality care. What is the role of arthroscopic surgery in degenerative knee disease? An expert panel produced these recommendations based on a linked systematic review triggered by a randomised trial published in The BMJ in June 2016, which found that, among patients with a degenerative medial meniscus tear, knee arthroscopy was no better than exercise therapy. The panel make a strong recommendation against arthroscopy for degenerative knee disease. Box 1 shows all of the articles and evidence linked in this Rapid Recommendation package. The infographic provides an overview of the absolute benefits and harms of arthroscopy in standard GRADE format. Table 2 below shows any evidence that has emerged since the publication of this article. Approximately 25% of people older than 50 years experience knee pain from degenerative knee disease (box 2).2 3 Management options include watchful waiting, weight loss if overweight, a variety of interventions led by physical therapists, exercise, oral or topical pain medications such as non-steroidal anti-inflammatory drugs, intra-articular corticosteroid and other injections, arthroscopic knee surgery, and knee replacement or osteotomy. The preferred combination or sequence of these options is not clear and probably varies between patients. Box 2: What is degenerative knee disease? Knee replacement is the only definitive therapy, but it is reserved for patients with severe disease after non-operative management has been unsuccessful.4 5 Some believe that arthroscopic debridement, including washout of intra-articular debris, with or without arthroscopic partial meniscectomy to remove damaged meniscus, may improve pain and function. Current guidelines generally discourage arthroscopy for patients with clear radiographic evidence of osteoarthritis alone, but several support or do not make clear statements regarding arthroscopic surgery in other common groups of patients (table 1⇓). Arthroscopic knee surgery for degenerative knee disease is the most common orthopaedic procedure in countries with available data14 and on a global scale is performed more than two million times each year (fig 1⇓).15 16 17 18 Arthroscopic procedures for degenerative knee disease cost more than $3bn per year in the US alone.19 A high prevalence of features advocated to respond positively to arthroscopic surgery (such as meniscal tears, mechanical symptoms, and sudden symptom onset) as well as financial incentives may explain why arthroscopic knee surgery continues to be so common despite recommendations against its use for osteoarthritis. Further, patients may be frustrated with their symptoms, having tried several less invasive management strategies by the time that they see the surgeon, and in many cases this may come with an expectation for surgical management. Moreover, many patients experience important and marked improvements after arthroscopy, which may be erroneously attributed to the effects of the procedure itself instead of the natural course of the disease, co-interventions, or placebo effects. Our international panel including orthopaedic surgeons, a rheumatologist, physiotherapists, a general practitioner, general internists, epidemiologists, methodologists, and people with lived experience of degenerative knee disease (including those who had undergone and those who had not undergone arthroscopy) met to discuss the evidence. No person had financial conflicts of interest; intellectual and professional conflicts were minimised and managed (see appendix 1 on bmj.com). The panel followed the BMJ Rapid Recommendations procedures for creating a trustworthy recommendation35 36 and used the GRADE approach to critically appraise the evidence and create recommendations (appendix 2).37 The panel considered the balance of benefits, harms, and burdens of the procedure, the quality of evidence for each outcome, typical and expected variations in patient values and preferences, and acceptability. Recommendations can be strong or weak, for or against a course of action. The systematic review on the net benefit of knee arthroscopy compared with non-operative care pools data from 13 randomised trials for benefit outcomes (1668 patients) and an additional 12 observational studies for complications (>1.8 million patients).21Figure 2⇓ gives an overview of the patients included, the study funding, and patient involvement in the design of the studies. Panel members identified three outcomes—pain, function, and quality of life—as the most important for patients with degenerative knee disease who are considering surgery. Although the included studies reported these patient-important outcomes, it is difficult to know whether changes recorded on an instrument measuring subjective symptoms are important to those with symptoms—for example, a change of three points might have completely different meanings in two different pain scales. The infographic provides an overview of the benefits and harms of arthroscopy in standard GRADE format. Estimates of baseline risk for effects comes from the control arms of the trials; for complications, comparator risk was assumed to be nil. The panel is confident that arthroscopic knee surgery does not, on average, result in an improvement in long term pain or function. Most patients will experience an important improvement in pain and function without arthroscopy. However, in <15% of participants, arthroscopic surgery resulted in a small or very small improvement in pain or function at three months after surgery—this benefit was not sustained at one year. In addition to the burden of undergoing knee arthroscopy (see practical issues below), there are rare but important harms, although the precision in these estimates is uncertain (low quality of evidence). It is unlikely that new information will change interpretation of the key outcomes of pain, knee function, and quality of life (as implied by high to moderate quality of evidence). The panel is confident that the randomised controlled trials included adequate representation from groups commonly cited to derive benefit from arthroscopic knee surgery for degenerative knee disease—notably those with meniscal tears, no or minimal radiographic evidence of osteoarthritis, and those with sudden but non-traumatic symptom onset. Thus the recommendation applies to all or almost all patients with degenerative knee disease. Further, the evidence applies to patients with any severity of mechanical symptoms, with the only possible exception being those who are objectively unable to fully extend their knee (that is, a true locked knee). We did not consider young patients with sports related injuries or patients with major trauma in any age. Trials that enrolled a majority of patients without radiographic osteoarthritis showed similar effect sizes to trials enrolling patients with radiographic evidence of osteoarthritis. Most of these trials exclusively included patients with meniscus tears. Meniscus tears are common, usually incidental findings, and unlikely to be the cause of knee pain, aching, or stiffness.1 Mechanical symptoms were also a prominent feature for most trial participants, and many had sudden or subacute onset of symptoms.23 24 25 26 Given that there is evidence of harm and no evidence of important lasting benefit in any subgroup, the panel believes that the burden of proof rests with those who suggest benefit for any other particular subgroup before arthroscopic surgery is routinely performed in any subgroup of patients. It takes between two and six weeks to recover from arthroscopy, during which time patients may experience pain, swelling, and limited function.27 28 Most patients cannot bear full weight on the leg (that is, they may need crutches) in the first week after surgery, and driving or physical activity is limited during the recovery period.27Figure 3⇓ outlines the key practical issues for those considering arthroscopic knee surgery versus non-surgical management for degenerative knee disease. Our strong recommendation against arthroscopy reflects a low value on a modest probability (<15%) of small or very small improvement in short term pain and function that does not persist to one year, and a higher value on avoiding the burden, postoperative limitations, and rare serious adverse effects associated with knee arthroscopy. The panel, including the patient participants, felt that almost all patients would share these values. The recommendation is not applicable to patients who do not share these values (that is, those who place a high value on a small, uncertain, and transient reduction in pain and function, and a low value on avoiding the burden and postoperative limitation associated with arthroscopy). Randomised trials—Does arthroscopic knee surgery benefit patients who are objectively unable to fully extend their knee or who have persistent, severe, and frequent mechanical symptoms? Implementation studies—What are the most effective ways to reduce the overuse of arthroscopic surgery for degenerative knee disease? Table 2⇓ shows evidence which has emerged since the publication of this article. As new evidence is published, a group will assess the new evidence and make a judgment on to what extent it is expected to alter the recommendation. Three people with lived experience of osteoarthritis, one of whom had arthroscopic knee surgery, were full panel members. These panel members identified important outcomes and led the discussion on values and preferences. Pain was weighed as higher importance for most patients: for example, the patient panel members felt that a possible small benefit to function without a reduction in pain would be unimportant to almost all patients. Those with lived experience identified key practical issues including concerns with cost and accessibility for both arthroscopy and interventions provided by physiotherapists. The members participated in the teleconferences and email discussions and met all authorship criteria. •Project: how many arthroscopic procedures are scheduled in your organisation for degenerative knee disease? •Based on the information you have read in this article or in this package of Rapid Recommendation articles, is there anything which you might alter your practice? •To what extent might you use information in this article to alter the conversations you have with patients with degenerative knee disease, or those considering arthroscopic surgery? This BMJ Rapid Recommendation article is one of a series that provides clinicians with trustworthy recommendations for potentially practice changing evidence. BMJ Rapid Recommendations represent a collaborative effort between the MAGIC group (www.magicproject.org) and The BMJ. A summary is offered here and the full version including decision aids is on the MAGICapp (www.magicapp.org), for all devices in multilayered formats. Those reading and using these recommendations should consider individual patient circumstances, and their values and preferences and may want to use consultation decision aids in MAGICapp to facilitate shared decision making with patients. We encourage adaptation and contextualisation of our recommendations to local contexts. Those considering use or adaptation of content may go to MAGICapp to link or extract its content or contact The BMJ for permission to reuse content in this article. We thank Alison Hoens for critical review of the recommendation and manuscript. We also thank Tahira Devji for expertly leading the systematic review of minimally important differences. Funding: This guideline was not funded. Competing interests: All authors have completed the BMJ Rapid Recommendations interests disclosure form, and a detailed, contextualised description of all disclosures is reported in appendix 1. As with all BMJ Rapid Recommendations, the executive team and The BMJ judged that no panel member had any financial conflict of interest. Professional and academic interests are minimised as much as possible, while maintaining necessary expertise on the panel to make fully informed decisions. Transparency: R Siemieniuk affirms that the manuscript is an honest, accurate, and transparent account of the recommendation being reported; that no important aspects of the recommendation have been omitted; and that any discrepancies from the recommendation as planned (and, if relevant, registered) have been explained. Englund M, Guermazi A, Gale D, et al. Incidental meniscal findings on knee MRI in middle-aged and elderly persons. N Engl J Med2008;359:1108-15. doi:10.1056/NEJMoa0800777 pmid:18784100. Nguyen US, Zhang Y, Zhu Y, Niu J, Zhang B, Felson DT. Increasing prevalence of knee pain and symptomatic knee osteoarthritis: survey and cohort data. Ann Intern Med2011;155:725-32. doi:10.7326/0003-4819-155-11-201112060-00004 pmid:22147711. Turkiewicz A, Gerhardsson de Verdier M, Engström G, et al. Prevalence of knee pain and knee OA in southern Sweden and the proportion that seeks medical care. Rheumatology (Oxford)2015;54:827-35. doi:10.1093/rheumatology/keu409 pmid:25313145. McGrory B, Weber K, Lynott JA, et al. American Academy of Orthopaedic Surgeons. 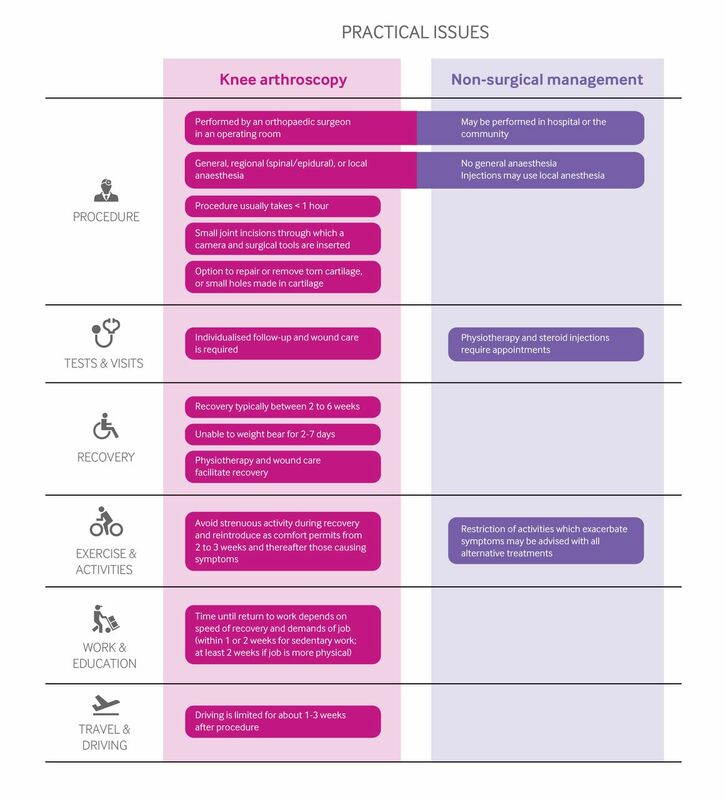 The American Academy of Orthopaedic Surgeons evidence-based clinical practice guideline on surgical management of osteoarthritis of the knee. J Bone Joint Surg Am2016;98:688-92. doi:10.2106/JBJS.15.01311 pmid:27098328. Skou ST, Roos EM, Laursen MB, et al. A randomized, controlled trial of total knee replacement. N Engl J Med2015;373:1597-606. doi:10.1056/NEJMoa1505467 pmid:26488691. Jevsevar DS. Treatment of osteoarthritis of the knee: evidence-based guideline, 2nd edition. J Am Acad Orthop Surg2013;21:571-6.pmid:23996988. National Institute for Health and Clinical Excellence. Arthroscopic knee washout, with or without debridement, for the treatment of osteoarthritis (Interventional procedures guidance IPG230). 2007. www.nice.org.uk/guidance/ipg230. National Institute for Health and Clinical Excellence. Osteoarthritis: care and management (clinical guideline CG177). 2014. www.nice.org.uk/guidance/cg177. Beaufils P, Roland B. ESSKA Meniscus Consensus Project. Degenerative meniscus lesions. European Society for Sports Traumatology, Knee Surgery and Arthroscopy, 2016. http://c.ymcdn.com/sites/www.esska.org/resource/resmgr/Docs/2016-meniscus-consensus-proj.pdf. British Orthopaedic Association, British Association for Surgery of the Knee. BOA/BASK response to media reports regarding knee arthroscopy. 2015. www.boa.ac.uk/latest-news/boabask-response-to-media-reports-regarding-knee-arthroscopy/. Australian Knee Society on Arthroscopic Surgery of the Knee. Position statement from the Australian Knee Society on Arthroscopic Surgery of the Knee, including reference to the presence of osteoarthritis or degenerative joint disease. 2016. www.kneesociety.org.au/resources/aks-arthroscopy-position-statement.pdf. Zhang W, Moskowitz RW, Nuki G, et al. OARSI recommendations for the management of hip and knee osteoarthritis, Part II: OARSI evidence-based, expert consensus guidelines. Osteoarthritis Cartilage2008;16:137-62. doi:10.1016/j.joca.2007.12.013 pmid:18279766. Zhang W, Nuki G, Moskowitz RW, et al. OARSI recommendations for the management of hip and knee osteoarthritis: part III: Changes in evidence following systematic cumulative update of research published through January 2009. Osteoarthritis Cartilage2010;18:476-99. doi:10.1016/j.joca.2010.01.013 pmid:20170770. Cullen KA, Hall MJ, Golosinskiy A. Ambulatory surgery in the United States, 2006. Natl Health Stat Report2009;(11):1-25.pmid:19294964. Adelani MA, Harris AH, Bowe TR, Giori NJ. Arthroscopy for knee osteoarthritis has not decreased after a clinical trial. Clin Orthop Relat Res2016;474:489-94. doi:10.1007/s11999-015-4514-4 pmid:26290345. Bohensky MA, Sundararajan V, Andrianopoulos N, et al. 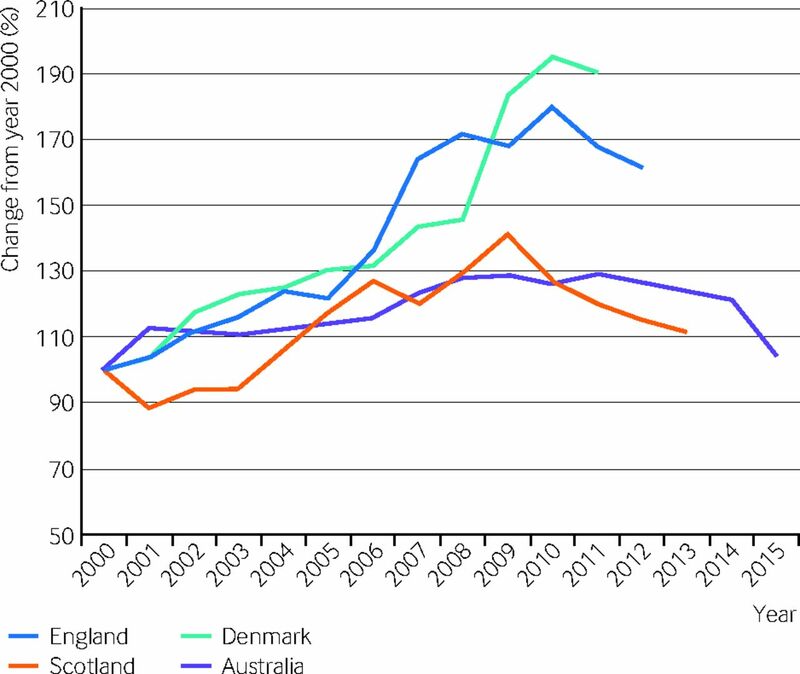 Trends in elective knee arthroscopies in a population-based cohort, 2000-2009. Med J Aust2012;197:399-403. doi:10.5694/mja11.11645 pmid:23025737. Hamilton DF, Howie CR. Knee arthroscopy: influence of systems for delivering healthcare on procedure rates. BMJ2015;351:h4720. doi:10.1136/bmj.h4720 pmid:26405226. Järvinen TL, Guyatt GH. Arthroscopic surgery for knee pain. BMJ2016;354:i3934. doi:10.1136/bmj.i3934 pmid:27439983. Devji T, Guyatt GH, Lytvyn L, et al. Application of minimal important differences in degenerative knee disease outcomes: a systematic review and case study to inform BMJ Rapid Recommendations. BMJ Open2017;7:e015587. doi:10.1136/bmjopen-2016-015587. Brignardello-Peterson R, Guyatt GH, Schandelmaier S, et al. Knee arthroscopy versus conservative management in patients with degenerative knee disease: a systematic review. BMJ Open2017;7:e016114. doi:10.1136/bmjopen-2017-016114. Guyatt GH, Juniper EF, Walter SD, Griffith LE, Goldstein RS. 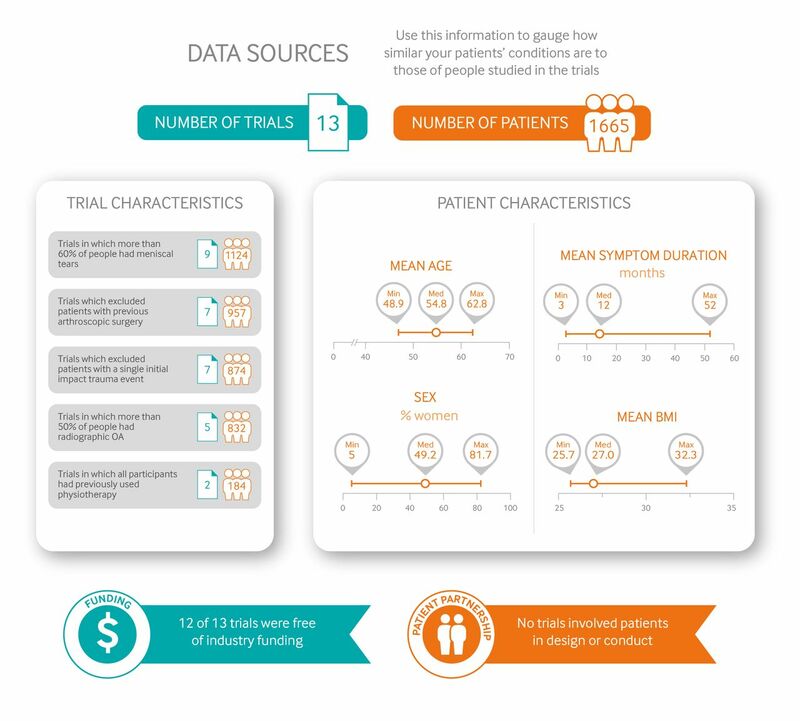 Interpreting treatment effects in randomised trials. BMJ1998;316:690-3. doi:10.1136/bmj.316.7132.690 pmid:9522799. Kirkley A, Birmingham TB, Litchfield RB, et al. A randomized trial of arthroscopic surgery for osteoarthritis of the knee. N Engl J Med2008;359:1097-107. doi:10.1056/NEJMoa0708333 pmid:18784099. Sihvonen R, Englund M, Turkiewicz A, Järvinen TL. Finnish Degenerative Meniscal Lesion Study Group. Mechanical symptoms and arthroscopic partial meniscectomy in patients with degenerative meniscus tear: a secondary analysis of a randomized trial. Ann Intern Med2016;164:449-55. doi:10.7326/M15-0899 pmid:26856620. Lubowitz JH, Ayala M, Appleby D. Return to activity after knee arthroscopy. Arthroscopy2008;24:58-61.e4. doi:10.1016/j.arthro.2007.07.026 pmid:18182203. Pihl K, Roos EM, Nissen N, JøRgensen U, Schjerning J, Thorlund JB. Over-optimistic patient expectations of recovery and leisure activities after arthroscopic meniscus surgery. Acta Orthop2016;87:615-21. doi:10.1080/17453674.2016.1228411 pmid:27622598.
de Rooij M, van der Leeden M, Heymans MW, et al. Prognosis of pain and physical functioning in patients with knee osteoarthritis: a systematic review and meta-analysis. Arthritis Care Res (Hoboken)2016;68:481-92. doi:10.1002/acr.22693 pmid:26316234. Marsh JD, Birmingham TB, Giffin JR, et al. Cost-effectiveness analysis of arthroscopic surgery compared with non-operative management for osteoarthritis of the knee. BMJ Open2016;6:e009949. doi:10.1136/bmjopen-2015-009949 pmid:26758265. Andrews JC, Schünemann HJ, Oxman AD, et al. GRADE guidelines: 15. Going from evidence to recommendation-determinants of a recommendation’s direction and strength. J Clin Epidemiol2013;66:726-35. doi:10.1016/j.jclinepi.2013.02.003 pmid:23570745. Kise NJ, Risberg MA, Stensrud S, Ranstam J, Engebretsen L, Roos EM. Exercise therapy versus arthroscopic partial meniscectomy for degenerative meniscal tear in middle aged patients: randomised controlled trial with two year follow-up. BMJ2016;354:i3740. doi:10.1136/bmj.i3740 pmid:27440192. Khan M, Evaniew N, Bedi A, Ayeni OR, Bhandari M. Arthroscopic surgery for degenerative tears of the meniscus: a systematic review and meta-analysis. CMAJ2014;186:1057-64. doi:10.1503/cmaj.140433 pmid:25157057. Thorlund JB, Juhl CB, Roos EM, Lohmander LS. Arthroscopic surgery for degenerative knee: systematic review and meta-analysis of benefits and harms. BMJ2015;350:h2747. doi:10.1136/bmj.h2747 pmid:26080045. Siemieniuk RA, Agoritsas T, Macdonald H, Guyatt GH, Brandt L, Vandvik PO. Introduction to BMJ Rapid Recommendations. BMJ2016;354:i5191. doi:10.1136/bmj.i5191 pmid:27680768. Vandvik PO, Otto CM, Siemieniuk RA, et al. Transcatheter or surgical aortic valve replacement for patients with severe, symptomatic, aortic stenosis at low to intermediate surgical risk: a clinical practice guideline. BMJ2016;354:i5085. doi:10.1136/bmj.i5085 pmid:27680583. Guyatt GH, Oxman AD, Vist GE, et al. GRADE Working Group. GRADE: an emerging consensus on rating quality of evidence and strength of recommendations. BMJ2008;336:924-6. doi:10.1136/bmj.39489.470347.AD pmid:18436948.